The Laser 4.7 is a phenomenal success story of junior and youth one design dinghy sailing. In recent years it has consistently been the largest Junior/Youth fleet at a World Championships. The Class’s first World Championships were held in 2002 in Holland, in 2018 there were 430 sailors competing in the Worlds in Poland and over 300 sailors competing in the Europeans in Greece. The universality of the Laser is no doubt a major part of the Class’s success globally and just as with the Optimist Class, the Laser 4.7 has a huge following of sailors, parents, coaches and merchants invested in it’s success. Britain was the largest nation of competitors at both 2018 events with sailors up to the age of 17 competing. 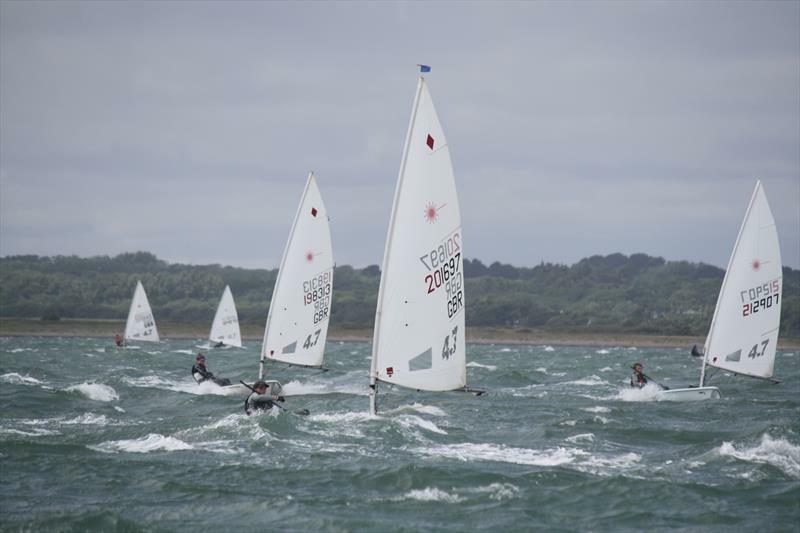 The RYA adopted the Laser 4.7 for their Olympic ‘Pathway’ some time ago and the prolific success of GBR across various Laser Fleets is in part due to the efforts put into Coaching the young sailors in the Laser 4.7. The RYA’s Laser 4.7 Head Coach in recent years, Martin Boatman, was recognised as “Coach of the Year” in 2016 following another successful year internationally. GBR sailors have enjoyed significant success in the Laser 4.7 at the highest level, with 5 U16 World or European Championship Podium positions from the last 3 seasons. Sailors from the Optimist, Topper, RS Tera and Cadet Classes are the most likely graduates into the Laser 4.7. The sailors typically begin to move into the Laser 4.7 at approximately 45kg, but the 4.7 enjoys a very broad competitive weight range for the Club sailor (50-70kg), due to a larger hull being paired with a smaller rig. Sailors typically begin to graduate from the 4.7 into the Radial rig at about 60kg onwards. In Britain, the UKLA runs a successful Laser 4.7 Ladder Series sponsored by SailingFast. This is designed to provide quality racing for the experienced Club sailor all the way up to the top RYA Squad sailors. Olympic Laser sailor Nick Thompson with recent Laser 4.7 sailors at a Ladder event. Former Youth World Champion and Finn Olympian, now International Race Officer, Stuart Childerley is assisting the Class with all aspects of Race Management. And former Laser National Champion Keith Videlo is the Laser 4.7 Class Representative. Keith will be working with the UKLA’s Youth Representative Ben Nicholls, whose two daughters have both recently won the Laser 4.7 U16 European Championships. In addition, there are a large number of active volunteers from amongst the parents of the Laser 4.7 sailors who help put on the Laser 4.7 Ladder events and it promises to be an exciting year ahead. UKLA Laser 4.7 SailingFast Ladder 5 is being hosted by WPNSA on 26/27 January. There is also UKLA Laser 4.7 & Radial Class Training at the ASWC-Portland this weekend. Over 50 young sailors will be training with former Olympian Laura Baldwin and former British Sailing Team Laser sailors led by Tim Hulse. Could you host the Youth Sailing Worlds?